If you decide before you order your booth that you want more light than average, then your booth can be manufactured with the desired number of light fixtures. Our team at Standard Tools designs booths and mix rooms with sufficient lighting, but adding more lights is a simple modification. Change to a brighter bulb or one that contrasts to the materials being sprayed. 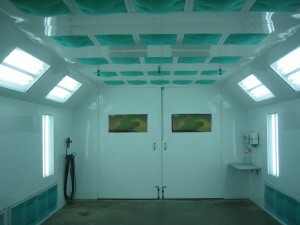 Apply a layer of booth coat to the inside of the spray booth walls. Different gloss levels are available and can be ordered from us. Add a light fixture. The standard outside-access light must be at least 36” from a booth opening (door) and requires a light frame. The inside-access lights can be placed anywhere and mount through a 15.5”x50.5” hole that can be cut into most panels. We can help you place an order for an extra light fixture. Contact us with any questions or if you would like us to assist in getting you more light! 1-888-312-7488.